Giovanni Battista Cipriani, RA, also known as Giuseppe Cipriani, was an Italian a painter and prolific draftsman of classical and allegorical subjects. In 1755 he moved to England and most of his work there consisted of murals for the decoration of private residences and designs for prints, many of which were engraved by his friend Francesco Bartolozzi. As a founding member (1768) of the Royal Academy, Cipriani was asked to design its diploma, which was engraved by Francesco Bartolozzi. Cipriani was born in Florence, but his family was originally from Pistoia. He first studied under Ignatius Hugford, a Florentine artist of English descent, then under Anton Domenico Gabbiani, another Florentine painter. Cipriani spent several years (1750 – 1753) in Rome, where he became acquainted with the architect, Sir William Chambers, and the sculptor, Joseph Wilton, with whom he accompanied to England in August 1755. Before moving to England he painted two pictures for the Abbey of San Michele in Pistoia, which launched him on his long and successful career. Soon after he was commissioned to paint one of the canvases on the organ in the Church of Santa Maria Maddalena dei Pazzi in Florence; and for the Church of the Oratory of Gesù Pellegrino, outside of the Porta San Galloand, he painted the main altarpiece. On his arrival to England in 1755, Lord Tilney, the Duke of Richmond, as well as other noblemen, requested Cipriani’s services. When William Chambers designed the Albany in London for Lord Holland, Cipriani was asked to paint one of the ceilings; he was also commissioned to paint part of a ceiling in Buckingham House and a room with poetical subjects at Standlynch in Wiltshire. At Somerset House, also built by his friend Chambers, he prepared the decorations for the interior of the north block, including the rooms into which the Royal Academy had recently moved – these rooms now house the Courtauld Collection. Sir Joshua Reynolds painted the central panel of the Royal Academy’s anteroom, but the four compartments in the coves, representing Allegory, Fable, Nature and History, were Cipriani’s. In the same building he also painted the monochrome decorations in the joint anteroom of the Royal and Antiquarian Societies. According to Joseph Baretti, in his Guide through the Royal Academy (1780), “the whole of the carvings in the various fronts of Somerset Place — excepting Bacon’s bronze figures — were carved from finished drawings made by Cipriani.” These designs include the five masks forming the keystones to the arches on the courtyard side of the vestibule, and the two above the doors leading into the wings of the north block, all believed to have been carved by Joseph Nollekens. The grotesque groups flanking the main doorways on three sides of the quadrangle and the central doorway on the terrace also appear to have been designed by Cipriani. Cipriani was a founder member (1768) of the Royal Academy, and designed its diploma, which was engraved by Francesco Bartolozzi. In 1769, in recognition of his services, the members presented him with a silver cup with a commemorative inscription. Cipriani was often employed by publishers to make pen and ink drawings, many of them engraved by his friend Bartolozzi. However, Capriani made some engravings himself, including “The Death of Cleopatra,” after Benvenuto Cellini; “The Descent of the Holy Ghost,” after Gabbiani; and portraits for Thomas Hollis’s memoirs (1780). He also painted allegorical designs for the Gold State Coach and the Lord Mayor’s Gold Coach, and repaired Verrio’s paintings at Windsor and Rubens’s ceiling in the Banqueting House at Whitehall. Cipriani is also known for his ornate furniture decorations and occasional drawer and door handle designs. Many of his medallions, most groups of nymphs and amorini, were frequently reproduced on elegant satin-wood furniture, which was growing popular and by the end of the 18th century became all the rage. These designs were sometimes inlaid in marquetry, but more often repainted onto the wood by other hands. It is believed that Cipriani painted some of the furniture designed by the Adams. 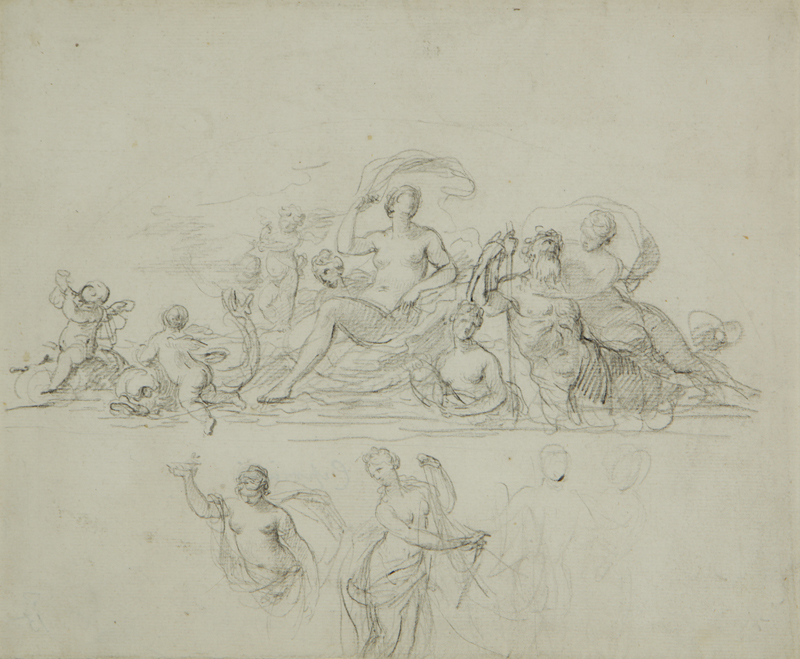 Drawings by him are in both the British Museum and Victoria and Albert Museum.